I’m not a HUGE Walgreens fan. I don’t really like the layout of the stores and their deals, usually, just aren’t as good as CVS. They have two different “rewards” type programs. One is the “Register Rewards” which is a coupon that prints out of the catalina machine that can be used like cash toward your next purchase. These are considered manufacturer’s coupons, though, which can present a challenge. For example, if you are buying Claritin you have a manufacturer’s coupon for Claritin, you would have to buy another item also to use your Register Reward (RR) because you can only use one manufacturer’s coupon per item. The other issue is that some Walgreens stores are limiting redemption to one Register Reward per transaction. The other “rewards” program they have is the EasySaver Rebate program. At the front of the store, there are EasySaver catalogs which contain store coupons (which can be combined with manufacturer’s coupons) that you can use throughout the month. There are also specific rebate offers. They have an online rebate redemption program now which makes it pretty easy to submit your receipts and receive payment. You can choose payment by check or on a Walgreens gift card (if you choose the gift card, they add a 10% bonus). Having said that, every now and then, Walgreens has some deals that are too good to pass up. *There will be several Kellogg’s coupons in the Sunday paper this week to help lower your expenses! There will also be a $10 Mail in Rebate when you purchase 10 Kellogg’s products. I read on one of the websites I like to visit that you have to purchase all 10 products in one transaction to do this rebate. **The cereal and snacks are two separate promotions, so you should be able to earn a $5 RR for each set. If you do this deal again, don’t use the RR to pay for the same promotion or your new RR will not print (for example, don’t use your RR from the snacks to buy more snacks…use it to buy cereal). There are some good scenarios on the link to Hot Coupon World that I posted above to show you how to use your coupons to get the Mail in Rebate with the least out of pocket expenses. There were $1/1 coupons in the inserts on 6/29. These band aids are about $2.99, so if you buy two of them and use two $1 off coupons, you will pay $3.98 and get a $3 RR back. **People are reporting that this deal is working already, so it is probably a month long deal. All laundry detergent will be on sale 2/$8. There are coupons for .50/1 and $1/1, so if you have two of them, you can get 2 things of detergent for $7 and you will get a $2 RR. *People are reporting that this deal is working already, so it is probably a month long deal. Bic pens – 2/$1 – there are printable coupons on Coupons.com for $1/2 and there will be coupons in this week’s paper as well for $1/2, so you can get free pens! There is also a $3 off coupon in today’s paper, so if you have that it is .99/each! Kleenex – there is an in-ad coupon for .89/each (limit 3). If you use the .50/3 coupon that was in last week’s paper, this is a good deal. Glade Plug ins are on sale for $4.99. There was a $4 off coupon in last week’s paper and there is a $2 rebate from Walgreens, so you may $.99 if you buy these and do the rebate. MONTH LONG DEAL ~ CHEAP MOVIE TICKETS!!! It looks like this deal is “dead” for now. Walgreens should be offering a promotion on full size bottles ($3.99/each) next week (buy 4, get 2 free movie tickets). In the paper a few weeks ago, there was a mail in rebate form for the Scrubbing Bubbles Action Scrubber. 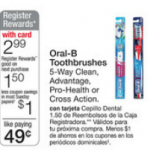 It is also part of the Walgreens monthly rebates. So, if you do this, you will make money ($4.25) buying it. It retails for $5.49. Use the $2.75 coupon, then submit the Walgreens monthly rebate and the Mail in Rebate form. You will get $5.49 for the mail in rebate and $1.50 for the Walgreen’s rebate (make sure you enter this online before you send in the receipt for the mail in rebate form). Subtract out the $2.74 you paid for it initially and you still walk away with $4.25. 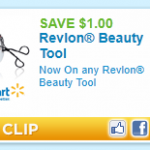 Walgreens: Get FREE Revlon tweezers! 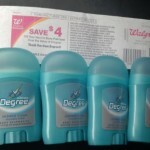 Get FREE Degree deodorant at Walgreens and Kroger!